Body odor is caused by certain infections in kidneys,liver or intake of heavy medicines or consumption of alcohol,caffeine and smoking.So to keep yourself free from it try eating fiber food,food containing lot of roughage,fresh fruits and avoid consumption of hydrogenated oils,white flour, refined sugar,red meat and other processed food.Also raw garlic. Maintaining proper hygiene also helps like taking bath twice a day , wearing clean clothes,not repeating once worn clothes without washing,keeping armpits clean and changing undergarments daily specially in summers and moist weather when bacteria activity is maximum. Add tomato juice in water and dip yourself in it for few minutes.One can also eat it to treat internally!! Apply white vinegar dipped in cotton to armpits . Apple cider vinegar mixed in water is also helpful. Make a mix of baking soda and lemon juice or vinegar and apply on the armpits to get rid of the smell. Make a drink of lemon and salt ,drink half of it and rest apply in your armpits and add to the bathing water. Drinking of sage tea is helpful and also making paste of them and applying on armpits will treat for the whole day. Turnip juice made by grating turnip and applying on armpits is useful! Instead of deodorant try applying baby powder . It will really help. Baking soda a very cheaply priced ingredient is a wonder product for odor. Not only it eats sweat ,kills germ but prevents bad odor. Apple cider vinegar mixed with warm water to be used to wash the body once a day to remain fresh. Nice information for this blog. I am happy to found this Website. Here about body health, nice information to give us. In above every topics are useful for everyone. I hope you collect more information about body health than publish article. Thanks for sharing your great ideas. 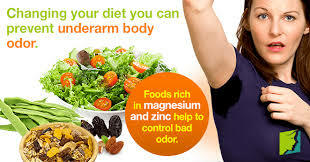 Bad odor is really a big problem for everyone most specially to women. It is a complete turn-off and once you're hit by it, is very hard to cure. 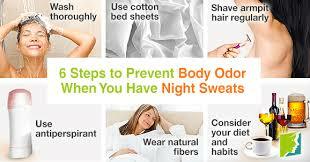 Thank you very much for sharing these steps to avoid body odor.